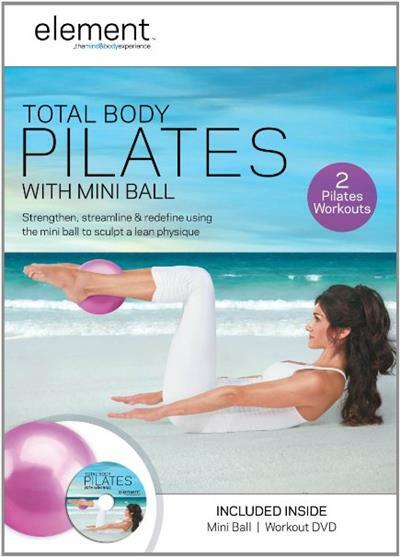 Filmed in a beautiful garden overlooking the Pacific Ocean, these two total body programs use the mini ball to add additional resistance to exercises, activate underused muscle groups, and emulate movements performed on the Pilates apparatus used in private studio sessions. The efficient 20-minute workout provides a complete and effective solution that fits any schedule. The powerful 30-minute workout goes even deeper into toning muscle and redefining your shape. Both focus on core strength, flexibility, flattening the abs, narrowing the waist, toning the arms and legs, sculpting the glutes, and creating a strong, healthy back. With regular practice, these programs will strengthen and streamline your entire body, yielding a whole new feeling of vitality. The mini ball will not only change-up your Pilates workout in a refreshing way, it will also produce faster and more dramatic results.